As a great break between the holidays, Bill and Jeremy over at DuPage Fly managed to have Chris Willen swing in for an afternoon of tying and talking musky. Bringing in some beer, talking musky, and a break from the craziness made for a recipe for success. For those of you not familiar with Chris, he's a truly fishy dude, seemingly dead set on catching every musky in the Midwest. Be it through his clients or wielding a Clutch rod himself, his musky knowledge is extensive. The guy can tie a pretty sick fly too. At DuPage he whipped up some articulated goodness for us all. A handful of people brought their vises and hopefully learned a few things. There were definitely a few good looking flies tied by some attendees as well. With about 20 people showing up all day, it was great to see the support for Chris. 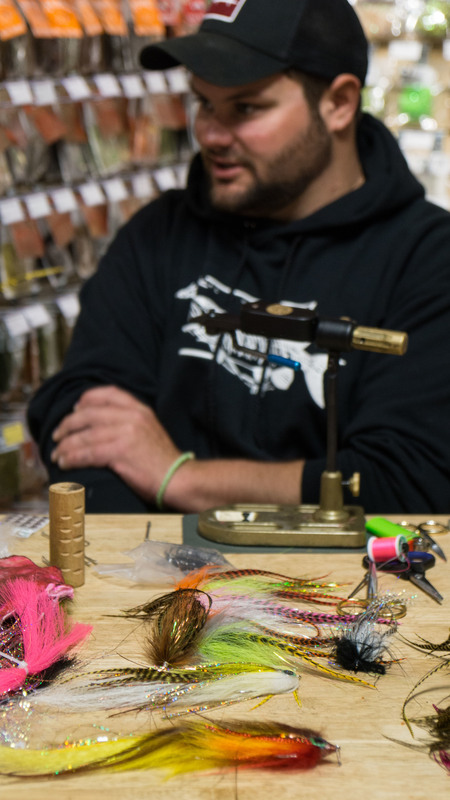 As he tied he answered lots of questions and reviewed a few tips and tricks for tying larger musky flies. The guys generously bought a bunch of pizzas and we all killed a few more beers before Chris gave us all a lesson on musky fishing and a bit more on the different fisheries he bounces around to throughout the year. It's truly impressive the miles the guy logs to chase these fish. A huge thanks goes out to Bill and Jeremy for putting the whole day together and for Chris for coming out and helping improve everyone's musky knowledge.